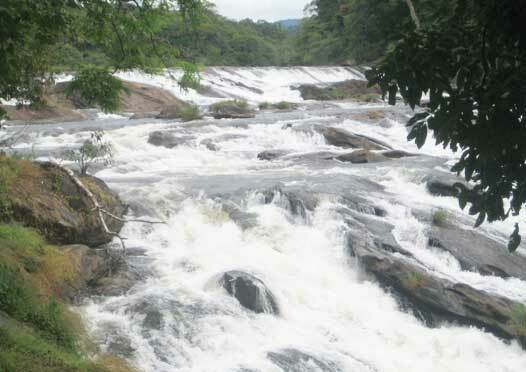 The Athirapally waterfalls provide a restful escape for those wanting to leave the hurried pace of city life behind. The water plunges and joins to the Chalakudi River. The scenic attraction of Vazhachal, the other picnic spot is just a drive from Athirampally. These scintillating waterfalls in the thick green forest are a part of the Chalakudy river stream. The riparian forests of the Chalakudy River have revealed the existence of a thick riparian vegetation of more than 10 meters width for a distance of 10.5 km downstream from Peringalkuth, covering an area of 58.5 hectares. Out of this, 26.4 hectares lie within the Vazachal area, including three large islands densely covered by riparian forests. 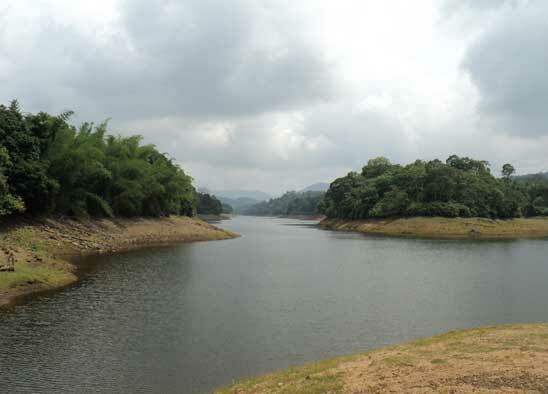 The riparian forests of the area have been found to be characterized by the presence of typical riparian species of plants, in addition to evergreen and semi-evergreen species.Out of the 319 species of flowering plants identified from the study area, 24 are endemic species of the Western Ghats and 10 are rare and endangered. Moreover, the Chalakudy River is known for its diversity, as it contains 85 species of freshwater fishes out of the 152 species known from Kerala. Among these, 35 are endemic species of the Western Ghats and nine are considered to be endangered. In the midst of these two water theme parks is Thumpurmuzhi, an ideal stopover with its garden, scenic splendor, and a classic waterfall. The park is ideally placed 55 km away from Thrissur. 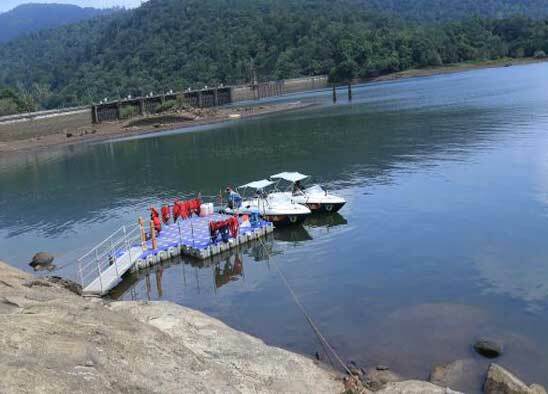 The park is situated on the banks of Chalakkudy river and you can also sight Thumpurmuzhi dam here. You can find here over 180 species of colorful butterflies. Some of them are the Lemon butterfly, Southern birdwing, Common rose, Light blue tiger, Dark blue tiger etc. If you are able to reach here in the morning, you will be lucky enough to sight big and several species of butterflies. You can also see here various plants like Pagoda flower, Rattlepods, Mexican heather or Hawaiin heather, Rubiaceae, Flame Lilly etc, Feeding the butterflies. Children can very well enjoy here as there is a children's park inside this beautiful garden. You will get various facilities like DTPC restaurant, bathing ghat, snack bar, a Chinese pavilion, washrooms and parking areas. This destination is well connected by roads and railway. You will have to pay a nominal entry fee for visiting Thumburmuzhi and if you want to take good snaps, take your camera along with you by paying the camera fee. To the east of Athirappilly is the enchanting but lesser known Charpa falls which plunges on to the road during monsoon. It is a sight to watch and enjoy. 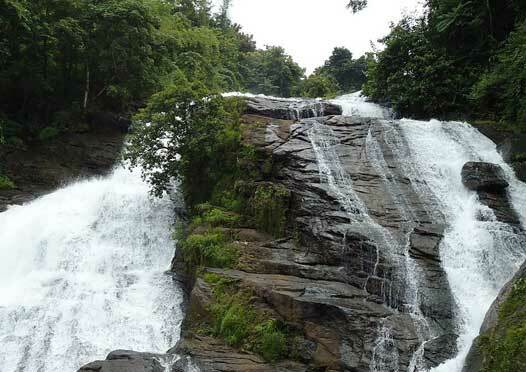 Located in the Athirapally Panchayat in Thrissur district, the Charpa falls lay in between the beautiful Athirapally and Vazhachal waterfalls, in the Chalakudy river. When compared to other falls, the Charpa waterfall is from a low height, but often tourists are attracted towards to this spectacular fall. 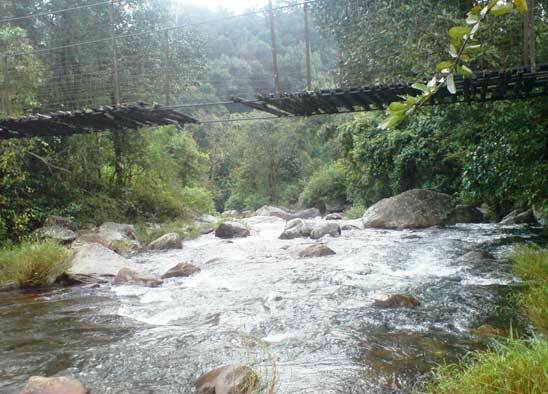 The waterfall is ideally located around 60 km away from Thrissur. Plantation Corporation of Kerala (PCK) is an independent company, which is purely based on the plantation. The Company has 705 hectors of oil palm plantation in its Kalady Group of Estates. Ideally placed on the banks of Chalakudy river, this oil palm plantation is blessed with its panoramic view. The scenic beauty of this plantation is attracting tourists to Sholayar Valley and Athirapilly. A major part of the Plantations is installed with drip irrigation system. Presently, 422 hectors of the plantation are ready for yielding and another 283 hectors are expected to reach yield level very soon. Deep in the forest on the way to Valpara are the two dams that generate hydroelectric power to the state. Entry to the dam site is with special permission only. Valparai Athirappilly Falls was located at the Chalakudi Lake that generates in the top reaches connected with the Western Ghats. Several endangered plus endemic varieties with flora and fauna tend to be observed in the jungles associated with the Athirapilly-Valparai location. This particular place is the only spot throughout the Western Ghats where some endangered Hornbill varieties are found. The Western Ghats can be just one of the most significant biodiversity sizzling locations in the globe. This priceless natural earth is undoubtedly degraded by means of mining, exploration, and hydroelectric tasks. Athirapally is famous among people. Valparai Athirapally falls is just one of the ideal destinations to check out in Kerala. Another famous waterfall to check out is that Valparai Waterfalls in Tamilnadu. Athirappilly Falls is the portion of the canal and that is around 80 feet in elevation. 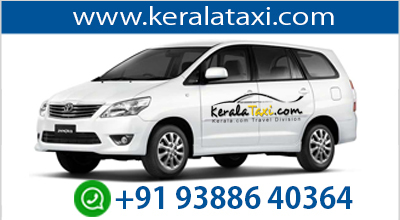 Athirappilly is quickly reachable via Chalakudy by having a car for hire or through bus through the Chalakudy government bus stand. Suitable safety measures are considered on spot to avoid accidents when swimming and the police get away is usually situated there. Athirappilly is located on road linking Tamilnadu and Kerala, every day after 6 PM traveling is not allowed. But people might get pleasure from the daring travel in the midsection of the jungle. From Coimbatore to Pollachi it is about forty Kilometers, Valparai is around sixty-five kilometer from Pollachi town, and the highway climbs way up steeply through Aziyar, Attagatti, Waterfall tea estates and Kavarkal to Valparai. From the Valparai town and on the way to Solayar, the highway will go via lustrous outrageous jungles following Malakkiparai. The road is as employs: From Valparai to Malakkiparai about twenty miles, from Sholayar twenty-one miles, Athirapalli Five kilometer. Generally, there is completely no human being settlement among Malakkiparai Dam. Animals like elephants and bison - spread around the highway, and evening traveling is frustrated. Athirapalli is on the Chalakudy River or canal. One can never skip visiting 'Poringalkuthu Hydel Project', while their trip to Athirappally. Around 5 km away from Vazhachal, you can spot Poringalkuthu Hydel Project. 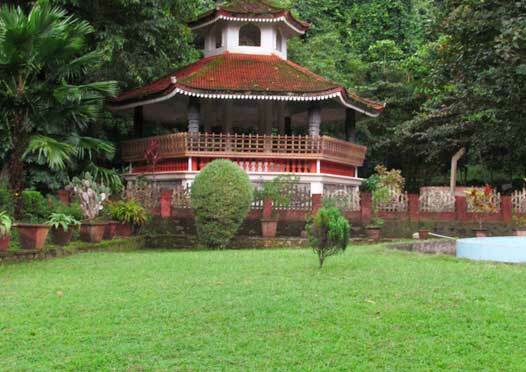 Here, you will definitely experience a breathtaking view of the enchanting nature around. Here you can sight a dam built on behalf of the hydel project before independence. The dam was commissioned in the year 1959. The equipment was bought from the UK. The dam and its premises can be enjoyed in its close proximity through boating. One can also make use of the pedal boats to experience the serene ambiance here. Enjoy the magnificent green environment around, while having a calm voyage through the water. At Poringalkuthu, you can also visit an inspection bungalow of the Kerala State Electricity Board. It is an Anglican-style building, built before independence. You will have to get prior permission to enter the dam site. For boating and for entrance, you will have to pay a nominal fee. Anakkayam is a beautiful place blessed with attractive lakes, spectacular waterfalls, mesmerizing green forest, rocks etc. Those who want to get away with the hustles and bustles of the city life, Anakkayam will be an ideal choice for making their trip the most memorable one. Anakkayam is ideally placed near Chalakkudy. The waterfall here is nestled in between the lush greenish environment and the sight of this will make you delightful. The name 'Anakkayam' means 'Elephant's pit'. Now it is believed that elephants had got drowned in the lake here and thus got the name 'Anakkayam'. This particular place was once the battlefield of Khilafath against the English. Anakkayam is a heaven for adventure lovers. Come and explore the mysterious forest at Anakkayam. The breathtakingly beautiful Anakkayam will be revealed again and again. Here you will be getting a very rare chance to come closer to nature and you will feel that you are one with nature. The best time to be at Anakkayam is from October to March.